Dress up your vehicle with this awesome Checker Flag & Blades Graphics kit. Starting at the front with a unique Blade design with a fade from Black to White, a Checker Flag blends in to the rear with Red to Yellow blades as shown. A fine Black outline enhances the whole design. This graphic is packaged with one (1) graphic for each side of the vehicle. 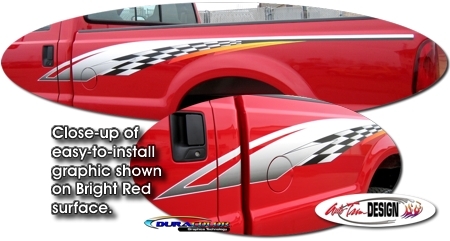 While graphic is shown on a Ford F250, this graphic will fit a wide variety of vehicles such as Chevrolet and Dodge trucks. Color scheme shown looks great on just about any color vehicle. Easy-to-follow general online installation instruction and care guide provided. Get'em today!